Note: The following essay was published in the proceedings for the 2012 ACSA International conference. I want to thank ACSA for giving me permission to repost it here on my blog. It might seem that very little is controversial about multiculturalism anymore. The notion that institutions of higher education should promote diversity and condemn overt forms of racism is a common value promoted in the official policies of Colleges and Universities across the United States. These values have guided the selection of faculty and student bodies, as well as promoted the creation of course offerings to address topics such as race, gender, and sexuality. In addition, the visual tropes of diversity that emerged in response to this institutional demand have included visual representations of black and brown bodies within a sea of middle-class aspirants who see higher education as a steppingstone to wealth and class mobility. This postwar image of American diversity may have began as a projective ideal, but it has become a contemporary mirror of the fundamental values that seem to propel our global society. It is important to deconstruct the power of this visual trope, especially in a field such as architecture which depends so heavily on image making practices. The phenomenal power of images of diversity demonstrates the notion that equality in visual representation is just as important as actual diversity. These images visually reinforce an institutional commitment to multiculturalism that is not always apparent in other ways. What this essay goes on to explore is the ability of visual representations of difference to mask the institutional failures of multicultural education. It examines the moments when multicultural representations actually undercut our ability to analyze and interpret the influence of racial discourses in architectural history. In line with these opening comments, this essay outlines two failures of multicultural surveys of modern architectural history. These failures consist of the masking of continued inequality in contemporary life, and a reductive consideration of the formal implications of racial discourses for modern architectural theories. The first failure is manifest in the historical shifts that occurred in multiculturalist debates between 1960 and 1990. During the 1960s, multiculturalism was an important paradigm for promoting the institutional protection of minority rights and privileges. Equal representation was conceptualized in terms of racial inequality, which prompted direct solutions to the unequal distribution of power within the State. On College campuses this translated into the invitation of student representational bodies to participate in faculty governance. After the legal victories of Civil Rights, however, many assumed that the political battles of multiculturalism were largely won. Confusing the legal abolition of racism with a definitive victory over inequality, the emphasis of multicultural rhetoric shifted from direct minority governance over minority affairs to the policing of minority identity in the public sphere. Struggling with a rise in neoliberal politics in the 1980s and an equally conservative interpretation of Civil Rights, the battle grounds for radical academics shifted to the maintenance of cultural representations of difference. Ironically, even as the representation of minority figures in academic canons increased, black poverty persisted in America and Latino poverty grew during the late 1980s and early ‘90s. This shift was also apparent in modern architectural history in the form of surveys that attempted to supplement European and American canons with female, minority, and subaltern elites, while failing to comment on the daily function of racial discourses in modern architectural history. Multiculturalism masked the persistence of poverty in the minority populations most marginalized by neoliberal regimes of power. The second failure of multiculturalism, at least in architectural history, has to do with the reductive terms in which race is considered relevant to the development of modern architecture. On the one hand, race is often interpreted in terms of the historical effects of racism on minority populations, which reverses the failure to reflect upon the structural effects of race theories outlined above. This oppression model of architectural history is prevalent in both postcolonial critiques of modern architecture that reveal the concomitance of European masters with the colonial project, as well as recovery projects that seek to redress the exclusions of talented minorities from the historical canon. On the other hand, it has become increasingly commonplace to think of race in cultural terms that are concretely manifest by one’s skin color, vernacular traditions, food and language diversity, and other forms of visual or overt representations of cultural difference. In these latter paradigms, race must be visual in order to be understood. These dominant racial discourses have made it increasingly difficult to interpret the formative influence of racial discourses on modern architectural thought. Being trained to think in cultural and visual terms, architects routinely equate vernacular styles and period ornamentations with typological categories that only mirror the cultural determinisms that essentialize difference. What often remains to be done is to peer beneath these superficial characteristics to articulate the structural relationships that made it possible for modern architects to think of race and style together in the past. Architectural history surveys persistently omit any discussion of the formal principles modern architects gleaned from their study of race and race theory. While one cannot ignore the promotional effects of political Empire on institutional racisms of the nineteenth century, it does not follow that every use of race in modern architecture was primarily motivated by a desire to suppress minority groups. It is possible instead to demonstrate that the historical study of race was also supported by disciplinary motivations, particularly in the historical reform of architectural style. In these terms, modern architects interpreted racial categories in abstract and formal terms that contributed to the reformation of architectural styles. Making this interpretation common in architectural history surveys will help architects and architecture students understand how deeply modern architects theoretically integrated the principles of race and style into their material practices. This essay presents an alternative to multicultural surveys of modern architectural history that specifically locates the structural influence of racial discourses on nineteenth century thinkers. It critiques the reductive consideration of racial discourses in multicultural surveys of modern architecture to locate the racial anthropologies inherent in nineteenth and twentieth century modern architectural theories. The racial anthropology of modern architecture becomes evident by tracing the historical integrations of race and style theories first documented in nineteenth century paradigms of architectural organicism. Architectural organicism was a broad based movement in Europe and the United States that reconfigured the conceptual relationship between nature and architectural style fundamental to neoclassical debates. The scientific revolutions of the eighteenth and nineteenth centuries recast nature in evolutionary terms that transformed the architectural importance of mimesis. As a result of these evolutionary paradigms for natural development, modern architects became to think of mimesis much more in terms of imitating nature’s procedures for generating variety than in visually imitating the varieties that were produced. This paradigm shift inaugurated a new epoch of race thinking in modern architecture that inherently privileged the scientific study of racial formations over the visual display of difference. To put it another way, it was no longer possible to think of architectural ornament as the starting point of race thinking in architecture; racial codes were now seen to be a direct result of evolutionary models of design. In light of this change, I argue that this procedural interpretation of natural evolution established a conceptual parallel between the generative principles of race theory and the procedural rules of modern architecture that lasted until the delegitimization of race science in the 1940s. This conceptual parallel established a theoretical tendency in modern architects to not only pair race and style categories in the European architectural style debates of the nineteenth century, but to ultimately think of race as style within the context of architectural theory. This theoretical integration of race and style categories established a racial anthropology for modern architecture that permitted architects to project the lessons of race science onto multiple creative contexts, including those not visibly marked by racism or overtly nationalist forms of visual representation. This alternative reading of modern architecture permits educators to supplement postcolonial critiques and revisionist histories of modern architecture with a demonstration of the fundamentally structural relevance of racial and ethnic discourses to modern architectural theories. Such an approach assumes that the influence of race thinking cannot be limited to the visualization of racial, ethnic, or cultural differences in material forms, but must extend to the rules and procedures that naturalized race thinking in modern architecture. Most importantly for the architect, race is shown to be an inherently formal category of modern architecture that was structurally embedded in multiple contexts. To demonstrate the viability of this conceptual model for classroom teaching, this essay outlines the pedagogical aims and student learning outcomes of a course I designed entitled “Race and Architecture.” This elective course, offered at the University of Pennsylvania (2007-08), Parsons the New School for Design (2008), Ohio State University (2010), and the University of North Carolina at Charlotte (2012), challenged students to examine the structural importance of racial discourses for modern architectural theories from the Enlightenment to the present. One of the key components of this course was the supplementation of multicultural readings of race in modern architecture with a theoretical investigation of race thinking in modern architectural theory. Students were asked to treat the values and assumptions of multiculturalism as a baseline for interpretation. Beginning with these basic assumptions, students were asked to investigate the abstract and formal implications of race theory for architectural designers, the institutional avenues through which these concepts found their way into architectural theory and practice, and the shifts in modern architectural theory that were a result of these conceptual innovations. By trudging the ground left fallow by traditional diversity rubrics in architectural education, students were able to successfully identify the latent function of racial discourses operating in modern architectures of the past. A noteworthy accomplishment of the class was my ability to successfully demonstrate to students the theoretical relationship between nineteenth century definitions of race science and the biological metaphors for architecture that became popular in the pre-war and inter-war periods. Students also examined the everyday influence of racial discourses on the habitus and corporate culture of the architectural profession that they were training themselves to enter. None of these lessons would have been gleaned by only celebrating the architectural productions of marginalized figures in architectural history or the apparent racisms of colonial politics, the traditional approach to race in multicultural surveys of architecture. In order to contextualize the innovations made by the “Race and Architecture” class, it is necessary to unpack the history of multiculturalism in higher education. Several scholars have documented the political and educational changes that have marked the historical shifts in multicultural debates. For example, Jodi Melamed has described shifts in the writings of radical liberal thinkers who inaugurated multiculturalism from 1960 to the present (Melamed 2011). She outlines the calls for increasing and protecting the political power of minority groups that marked the 1960s, to the eventual softening of this rhetoric with integrationist strategies that increased the visibility of elite minorities during the 1980s and ‘90s. The most recent phase of multicultural discourse is marked by the political appropriation of multiculturalism by post-racial and neoliberal thinkers in the new millennium (Melamed 11). 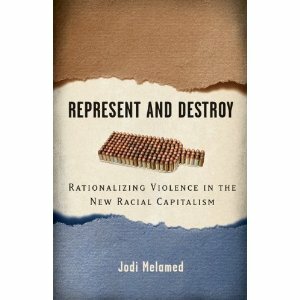 Melamed has criticized the historical trajectory of multicultural reform in higher education for paradoxically masking racial inequality by institutionalizing concrete definitions of racial identity that are too reductive to explain the complex operations of racial privilege in contemporary society. This critique has been made by both progressive and conservative academics, with each group emphasizing the effects of class and inequality in competing ways (Michaels, 2006; Hollinger, 2006; Melamed, 2011). As Nathan Glazer has suggested with the title of his 1997 book, no matter our political orientation, We Are All Multiculturalists Now. Melamed specifically targets the legitimating function of multiculturalism in neoliberal regimes of power that provide a rubric for policing racist speech and sanctioning the formal inclusion of elite minorities, but rarely move beyond such ceremonial gestures to articulate and defend the rights and privileges of the most poor and disenfranchised members of societal groups. This criticism can also be applied to the discipline of architecture, which has a poor historical track record of retaining minority talent in both professional and academic circles. In the field of architectural history, multicultural rubrics have supported recovery projects of a few token minorities who have been deemed exceptional by architectural historians. However, little has been done to displace the canonical values of traditional Western culture that continue to structure our view of the field. Other modes of architectural design have not been contemplated as worthy of study, even in the newest surveys that attempt to outline a global architecture history of architecture (Jarzombek, Prakash, Ching, 2010). The thesis is that our identity is partly shaped by recognition or its absence, often by the misrecognition of others, and so a person or group of people can suffer real damage, real distortion, if the people or society around them mirror back to them a confining or demeaning or contemptible picture of themselves. Nonrecognition or misrecognition can inflict harm, can be a form of oppression, imprisoning someone in a false, distorted, and reduced mode of being. Part of the motivation behind multicultural reform in higher education has been the realization that the nonrecognition or misrecognition of women and minorities can subliminally reinforce a harmful image of social norms. This social imagination of racial and ethnic traditions exists in democracies writ large as Taylor discusses them, but they can also extend to the conception of culture held by semi-autonomous academic units within the University as educational reformers have shown in their study of architectural education (Davis, 1993; Ahrentzen, Anthony, 1993; Bozogdan, 1999). The desire to include a positive image of minority or oppressed peoples in architectural education has proven to be a very powerful motivating force behind educational reforms in the last two decades (NAAB 2009). On closer examination of Taylor’s essay, however, one finds that the most complex aspect of his argument is not present in the articulation of the politics of recognition. Instead, it is evident in his critique of the practical limits of multiculturalism as a model for educational and political reform. Both the good-natured intentions of radical reformers as well as the cynical accommodation of neoliberal critics have clearly demonstrated that multiculturalism has its limits. According to Taylor, the limits of this rubric are very clearly manifest in the practical accommodations that have been made in institutional contexts (both political and academic) to appropriate multicultural principles for very partisan purposes. This critique can be made of both radical and conservative parties within the academy. As an example, one can assess the negative effects that a singular focus on racism and minority rights has had on elevating the appreciation of difference over the formulation of new forums for collective engagement. The critical dialogue concerning race relations often degenerates into the policing of political correctness, or worse, into the prima fascia accommodation of ‘diversity’ to forestall any claims of institutional racism. The substance of Taylor’s critique also lies in the relativist attitude that requires one to consider all cultures of equal worth, even before their worth can be demonstrated by actual historical research. Such a critique is very important in architectural education where history courses present a very limited curricular opportunity to educate future architects on the artistic traditions that influence design values. Taylor also critiques neoliberal attempts to include multiculturalism that amount to tokenism in the form of a minimally expanded historical canons that does not critically reframe traditionally accepted criteria. This technique of expanding the Western canon is a very popular conservative response to multiculturalism, as it does not require any fundamental change to the criterion one uses to assess excellence. In art and architecture, these values often include formal experimentation, monumental forms, and other values associated with Western ideas of innovation. Instead of looking to reframe the criteria for assessing canonicity, neoliberal multiculturalism places the burden of assimilation onto the very backs of minority populations that multiculturalism was originally created to protect. For Taylor, such a minimal form of accommodation – a purely formal accommodation of difference – is the most cynical and debilitating form of recognition in operation today. A persistent challenge in teaching architecture students about the effects of racial discourses in architecture occurs in the first few moments you ask them to articulate the conceptual relationship that binds the terms ‘architecture’ and ‘race’. As Darell Fields puts it in his text Architecture in Black, the technical training of the architecture student unconditionally leads them to ask, “What does architecture have to do with race?” (Fields, 2000). Prompting the students to move ahead without first having an answer in hand was one of the greatest challenges of this course. The following is an outline of some of the results of teaching a course on race and architecture between the years 2007 and 2012. This course evolved as an experiment with an alternative model to diversity courses presently being taught in the architectural academy. This course was purposefully designed to fulfill (and exceed) the diversity requirements then listed in the National Architecture Accreditation Board’s standards for “Student Performance” in professional schools. According to the NAAB requirements in place at the time (c.2007), students were only required to have a critical “awareness” of the contributions of social minorities and non-Western figures to architectural history. This was in comparison to the requirement to “understand” Western historical narratives of architectural history and have the “ability” to use standard techniques for designing in these contexts. The pedagogical aims of my course were to combine all three aspects of the student performance requirements, which in effect exceeded the minimal standards, to provide students with a critical framework for assessing diversity issues. 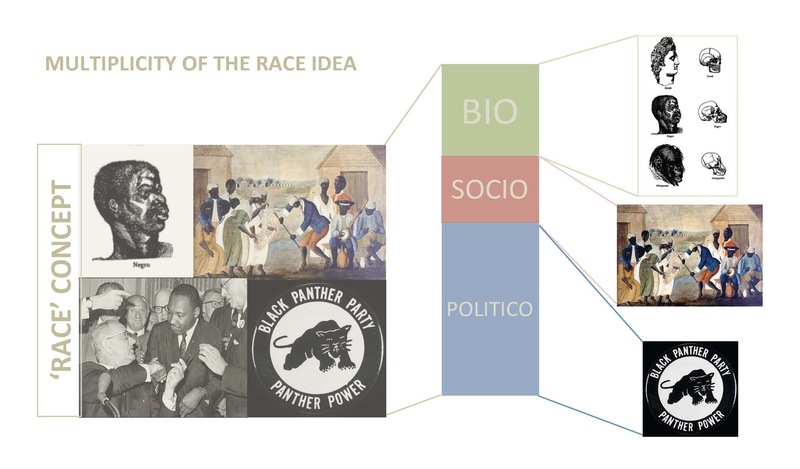 This course sought to provide students with (1) a critical “awareness” of the seminal definitions of race dating from 1750 onwards, (2) an “understanding” of the conceptual and methodological functions of the race idea in architectural discourses of the same time period, and (3) the “ability” to use physical case studies to identify how these issues were materialized in architecture with research papers and class presentations. As a result of mid-term and end of the semester student evaluations, I was able to expand the thematic material presented in subsequent classes to reflect student interests on interwar and postwar topics. These new class sessions included discussions of vernacular architectures in the U.S. and the inviting of guest speakers to discuss the elusive definition of modernism in China, the development of modernism in Kuwait, and other topics of similar interest. The beginning of each course was spent analyzing the multiple definitions of ‘race’ that emerged between 1750 and the postwar period. These definitions included the fields of Natural Philosophy, Biology, Anthropology, Sociology, Political Science, Cultural Studies, and Critical Race Theory. We grouped these disciplinary readings under three recurring racial discourses operating in architecture today: Social Histories of Architecture (for writings in Sociology & Cultural Studies); Political Discourses in Architecture (for writings in Political Science & African American Philosophy); and Biological and National Constructions of Regional Identity (fro writings in Biology, Anthropology, and Natural Philosophy). 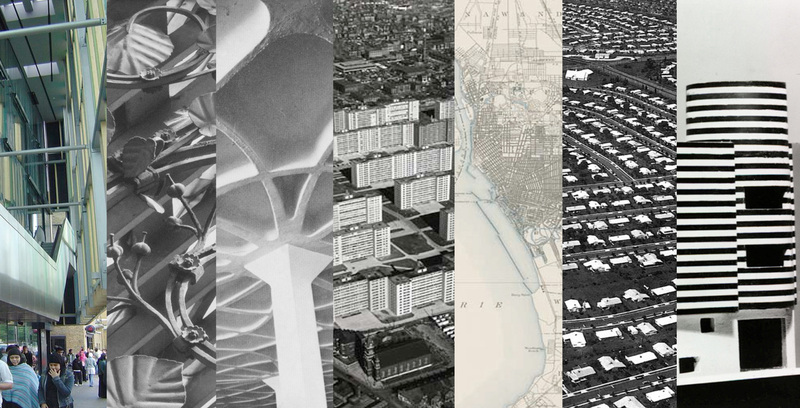 This range of critical approaches presented an interdisciplinary framework for class discussions, and permitted each student to keep track of which definitions influenced architects at different periods in time. Writings in architecture and the humanities were paired under each one of the racial discourses presented above. In addition, architectural case studies were provided so that students could understand what the material implications of each discourse had been throughout history. With respects to European architectural history, a large portion of the course dealt with analyzing the influence of nineteenth century theories of architectural organicism on the historical integration of race and style theories. This theme was an outgrowth from my dissertation research at the University of Pennsylvania, which reached completion in 2009. Using this research, I was able to demonstrate how designers used architectural organicism to integrate race and style theories in their work. In effect, they thought of race as style by extending their estimation of race beyond the static taxonomic categories of biology and ethnography to conceptualize the underlying estimation of the abstract principles of naturalism that were manifest in racial formations. This abstract interpretation of race established a racial epistemology for design within modern architecture that registered at the most abstract levels of procedural design thinking as well as the more obvious systems of visual ornamentation that supported political movements like colonialism. However, it was the turn toward procedural thinking that enabled architects to relate design to the cultural context. Using this conceptual model to illustrate the complex effects of racial discourses on architectural thought, it was possible to show students the limits of multiculturalism for analyzing architectural history. We found that organic interpretations of nature led nineteenth century architects to rethink historical styles as active processes of becoming, which encompassed scientific theories of racial formation. The class examined the writings and buildings of Eugene Emmanuel Viollet-le-Duc, Gottfried Semper and Adolf Loos to demonstrate the conceptual parallels that permitted each of these architects to interpret race as style in the past. The parallel illustrations of race types and vernacular architecture found in Viollet-le-Duc’s History of Human Habitation (1876) was especially useful for isolating this dynamic for the students, and the research conducted during the class helped me to publish an article that further analyzed this dynamic (Davis 2010). In order to link the work that I conducted within different Universities between 2007 and 2012, I made an effort to keep the methodology intact: students were always exposed to primary literatures in architecture, the always used physical case studies to interpret how architects formalized their abstractions, and they compared primary texts in architecture with literatures across the humanities to examine the intersections of race and architecture from a non-technical point of view. When read together, this comparative reading list permitted students to identify why architectural ornament became an emphasis of architectural practice, and how these elements could be used to reinvent ethnic traditions to fit European cultural contexts. In this way, students were being trained to see architecture as a cultural practice capable of integrating technical and social elements, another component of the NAAB requirements. Although most of class was spent isolating the theoretical and methodological import of race thinking in architectural organicism, several students decided to explore the postcolonial legacies of modern architecture in their research papers. This was particularly true with those interested in American vernacular traditions and global modernisms. For these reasons, I directed these students to the contributions of postcolonial scholars in architectural history. The overall structure of the course made it possible for them to integrate this literature into their desire to reconsider the development of Modern Architecture from a global perspective without reducing the entire course to a postcolonial survey. It should go without saying that the brief review of architectural history I applied to this course could have been expanded to include other cultural periods and legacies, including other subaltern regions and even African-American, Asian-American and Latino-American historical traditions. However, the goal of addressing the practical, theoretical and ideological dimensions of race and ethnicity in architectural history need not change. Beginning in 2009, I had students choose between writing a research paper as a final project or create a series of analytical maps that explored the material intersections between architecture and race. The mapping projects were designed to be place based, and they typically explored one of the settings introduced in class in greater detail. These visual experiments were extremely useful for helping the students to realize how race and place come together in physical spaces. The sites chosen for these projects included the Brooklyn neighborhood of Charlotte, North Carolina, the borderlands between San Diego and Tijuana, the Poston Relocation Camp created for Japanese internment in the 1940s, and the Pruitt-Igoe housing complex in St. Louis, Missouri – to name just a few. 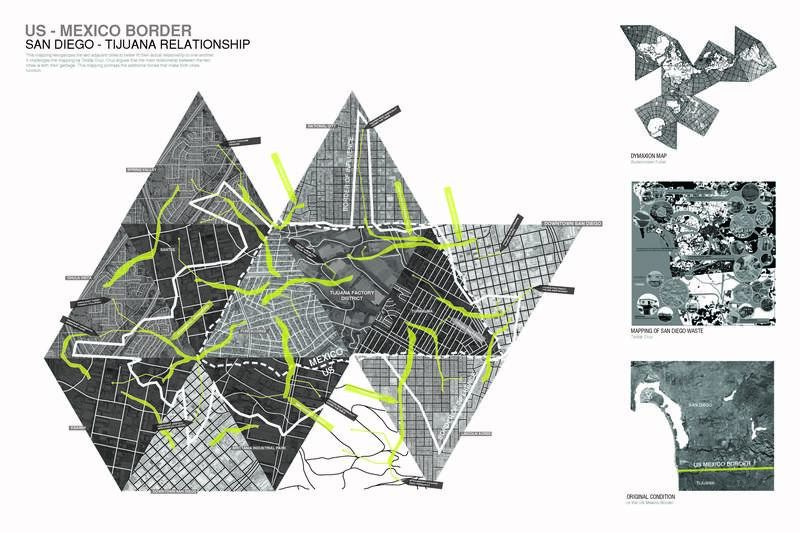 In the case of the borderland condition between San Diego and Tijuana, the student in question created a map that placed Mexican spaces and residents at the center of a vast ephemeral network of relations that spread across the border into and Diego and back into Mexico. This representational strategy inverted the geographical and political hierarchies that separated First- and Third-World countries to represent the centrality of Mexican labor for the American economy, as well as the interrelationships that make this borderland region one extended space. In terms of student outcomes, this course explicitly demonstrated the ways that historical concepts continued to exert an influence on the present. Pairing readings and case studies enabled everyone to leave the class with a clear understanding of how race and architecture have come together in the past. The one limitation of using an elective course to teach students about race and architecture was that the population was very limited; although most of the students enrolled were not primarily from minority populations, the sample was usually small (less than 20 students). The next step was to take the lessons I had learned in this elective course and apply it to an historical survey class. I was able to do this at three different Universities – the University of North Carolina at Chapel Hill (2009), Ohio State University (2010), and the University of North Carolina at Charlotte (2012). An important pedagogical goal of this course was to prepare case studies for the elective course that could be seamlessly integrated into surveys classes reserved for the core curriculum. 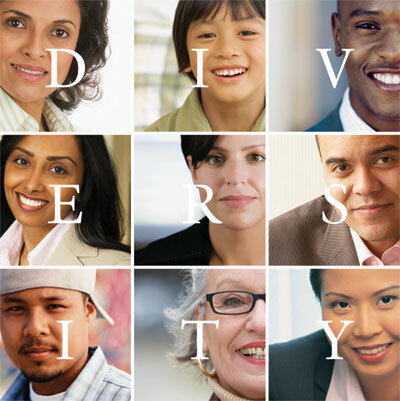 Too often, diversity courses are introduced at the behest of disgruntled minority students who make up the core audience of these specially designed elective courses, which then quickly disappear from the overall curriculum (Davis 1993). Mandating a dialectical relationship between elective and core course content is a clear innovation over current practices because it infuses the lessons gleaned in this restricted setting to the collective student body – a population that must also become involved with institutional reform if multiculturalism is going to produce long-lasting reforms. One of the biggest obstacles to overcome when speaking of race and architecture is to demonstrate how race is always and already formal for the architect. An exclusive focus on including minority historical figures does little to expose the abstract and formal mechanisms of design thinking that abstract and normalize racial codes. Revealing the basis of this instrumentality requires a new analytical lens. For these reasons, this paper has argued for a new approach to analyzing the influence of racial discourses on architectural historiography that moves beyond establishing multicultural surveys of history. This alternative rubric examines the simultaneous social, political, and formal consequences of racial discourses without truncating design thinking beneath cultural history. It encourages a networked approach to relating race and architecture that prepares student to begin studying the effects of race theory on design thinking and work their way back to the cultural functions of this work in a more general sense. Since it is impossible for me to outline the historical integrations of race and style in the confines of this essay, I point the reader to my dissertation research as well as a recent article that has appeared in the journal Architectural Research Quarterly. Both references are cited in the bibliography at the end of this essay. Charles Taylor adopts his endorsement of moving in a broader horizon from Hans Gadamer’s emphasis on creating a fusion of horizons. Both figures essentially encourage a collective shift from ideological emphases on individual rights and privileges to one of global participation and engagement. The guest speakers included Jenny Wah Ko and Assel Al-Ragam, both PhD students at the University of Pennsylvania, Lance Freeman, Professor of City Planning at Columbia University, Darell Fields, Professor of Architectural History and Theory, and Elijah Anderson, Professor of Social Work at the University of Pennsylvania. Charles L. Davis, “Tracing the integrations of race and style theory in nineteenth-century architectural style debates: E. E. Viollet-le-Duc and Gottfried Semper, 1834-1890” (January 1, 2009).